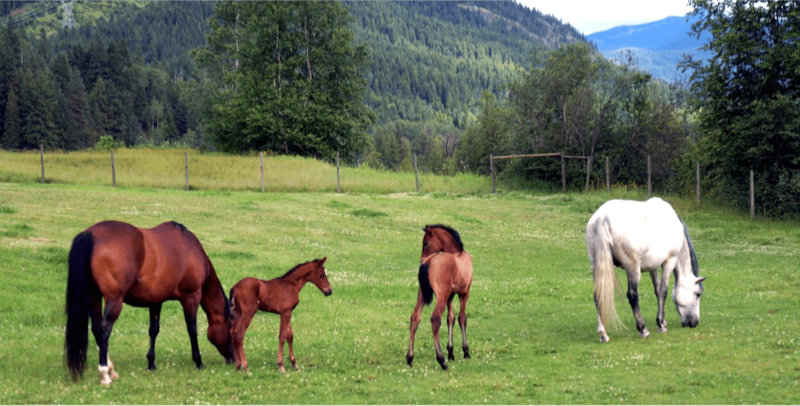 Owned and operated by Dr. Anne Starr and Brian Rehwald, Valhalla Andalusians’ home is a 45-acre farm situated at the southern end of the beautiful Slocan Valley near Nelson, British Columbia, Canada. In this stunning environment we breed, train, show and sell Pura Raza Española (PRE) Andalusian and Andalusian cross horses. We also offer stud services to outside mares. Nestled in a broad curve of the Slocan River in the fertile valley bottom and surrounded by the lush wilderness of the rugged Valhalla and Airy Ranges of the Selkirk Mountains, we are truly in a heavenly place. Life is very good here on the farm and all of our animals lead an enviable existence. They are fed the organic hay we grow on our farm, drink the fresh water that cascades down the mountain slopes above and run free in our green pastures from spring until fall. Here at Valhalla Andalusians we pride ourselves in being the best breeders that we can possibly be. We started out small and had the philosophy to always “buy big” and “breed up” to the point that all of our current breeding stock have either produced US and/or Canadian National Champions or are themselves US and/or Canadian National Champions. The quality of conformation, movement and talent that we have in our barn now is incredible . We’ve always believed that to produce top quality offspring you have to have both talented and beautiful mares and stallions. Their temperaments are crucial for producing that riding partner that always gives 110%. We currently have two breeding stallions standing at stud. VA Manolete’s Hijo Amado is our 2010 black PRE stallion and he stands 16.2 HH. He is the son of our foundation stallion and international dressage champion, Mystiques Manolete. Amado was the 2010 US National Reserve National Champion Colt, 2 and under at only 5 months of age. Here in Canada he was the 2014 National Champion Jr. Stallion and Gold Medal Movement winner. In 2015 Amado was the National Champion Senior Stallion and Gold Medal Movement winner. Amado has already produced a number of National Champions including the 2013 Canadian National Supreme Halter Champion colt VA Alejo and the 2015 Canadian National Supreme Halter Champion, VA San Paulo, both won at only 4 months of age! Last year Amado’s offspring cleaned up in the filly department winning both National Champion and the Reserve Champion Filly, 1 year and under with VA La Reina and VA La Luna Elegante respectively. His 2017 foal crop is outstanding this year. Norteño Rey MA – is our 2015 grey PRE stallion. He was revised in 2018 and the Spanish delegate suggested the he thought he was such a superior stallion that he should go further and be Qualified. Something that we are seriously considering especially after seeing his first few foals on the ground. The movement and quality of these 2018 foals is at a whole new level. Norteño is standing 16.3 HH as a 3 year old and has so much presence and incredible movement that he will take your breath away !! In 2017 he was the Canadian National Champion 2 yr old Colt and Gold Medal Movement Winner. He was also shown at the Andalusian World Cup in Las Vegas and was Champion 2 yr old Colt there also. He was shown as a yearling and was the 2016 National Champion Colt, 1 year and under and Gold Medal Movement winner. His sire is the US Multi-National Champion Escamillo (National Champion Sr Stallion and National Champion Best Movement) and his dam is the US Multi-National Champion Sonaja (National Champion Sr Mare and National Champion Best Movement winner). In addition to having these outstanding parents, Norteño has a full brother (Brioso MA) that is the only horse in US history to win the Grand Slam. Brioso won the National Champion Colt, 2 and under, National Champion Jr Stallion, National Champion Sr Stallion, National Champion Best Movement and 2 Futurities. All of these horses (Escamillo, Sonaja and Brioso) were shown by the late, great Warren Mather (most decorated Andalusian Halter trainer/ Handler in the US). Warren hand picked Norteño for us declaring that he was even better than Brioso – time will tell. Thank you to Mario Contreras of Mario’s Andalusians for agreeing to sell us this absolutely incredible stallion and also for allowing us to name him. “Norteño Rey” means “Northern King” which we felt was fitting for such a regal horse living up in Canada. Norteño will be standing to a limited number of outside mares in 2019 so book early. We also have nine Andalusian brood mares of which seven of them are either US or Canadian Multi-national champions or both. The two mares that haven’t been shown to a National title are OA Sienna (she has never been shown but has produced five national champion foals) and VMF Gema Preciosa (she broke her hip as a yearling preventing her from being shown but is a very happy brood mare). We also had VA La Duquesa enter the brood mare ranks 2016 and in 2017 and she and Amado gave us a beautiful grey filly, VA Espiritu Preferencia. In 2018 Duquesa gave us a stunning grey colt by Norteño (VA Viajero) with movement to die for. Duquesa was the 2017 and 2016 Canadian Supreme Halter Champion and the 2017 and 2016 National Champion Jr. Mare and Gold Medal Movement winner. A great addition to the band of girls. For more information on any of these horses and their pedigrees please refer to the individual pages for each horse where you will find full biographies, photos and video links.